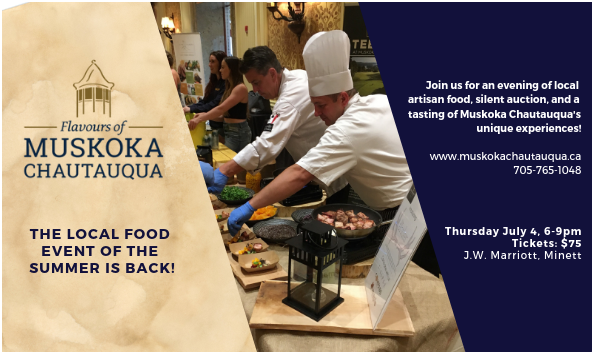 As Muskoka Chautauqua’s main fundraiser, Flavours of Muskoka Chautauqua is great food for a great cause: raising funds for arts education in Muskoka. This year’s 19th annual fundraiser will support new creative programs that will help strengthen personal, social, and emotional well-being for children and youth in Muskoka. In an effort to increase funds raised, we have decided to split up the silent auction component into two parts. Some items will be listed online a few months prior to the event, while others will only be available to bid on during the event on July 4th.